Please use this site to assist you in troubleshooting most geothermal heatpumps. Although please note that I am not responsable for any damage to any equipment that you work on following these guide lines. If operational difficulties are encountered, perform the preliminary checks below before referring to the troubleshooting charts. Because some controls are mounted internally and high voltage connections are exposed if the cabinet is opened, only a qualified technician should access them. I'll be constantly working on this site so check back. * Check the air filter. Dirty air filter or dirty coil will affect air flow and head pressures. * Check the water supply. Is there water flowing thru the heat exchanger. * Verify that the unit is receiving electrical supply power. * Verify that there is pressure in the loop. * Verify that the loop pumps are running. broken or disconnected wires, etc. Be certain that the thermostat is set higher than the actual room temperature and the selector switch to heat if in heating mode, or that the thermostat is set lower than room temperature and the selector switch is on cool if air conditioning is desired. If the thermostat is programmable, make sure it has fresh batteries. All inputs are 24VAC from the thermostat and can be verified using a volt meter between C and Y, G, O, W.
24VAC will be present at the terminal. The compressor relay input is 24VAC and can be verified using a voltmeter. The fan signal is usually passed to an external fan relay and the input is 24VAC and can be verified using a voltmeter. X X Restricted metering device Check superheat and subcooling per chart. Replace. X X Inlet Water too Hot or Cold Check load, loop sizing, loop backfill, ground moisture. X Inlet Water too Hot Check load, loop sizing, loop backfill, ground moisture. X X Restricted metering device Low Suction Pressure Check superheat and subcooling per chart. Replace. Only Compressor Runs X X Thermostat wiring Check G wiring at heat pump. Jumper G and R for fan operation. X X Thermostat wiring Check thermostat wiring at heat pump. Jumper Y and R for compressor operation in test mode. Unit Doesn't Operate in Cooling X Reversing Valve Set for cooling demand and check 24VAC on RV coil. If RV is stuck, run high pressure up by reducing water flow and while operating engage and disengage RV coil voltage to push valve. X Thermostat wiring Check O wiring at heat pump. Jumper O and R for RV coil 'Click'. X Thermostat wiring Put thermostat in cooling mode. Check for 24VAC on O (check between C and O); check for 24VAC on W (check between W and C). There should be voltage on O, but not on W. If voltage is present on W, thermostat may be bad or wired incorrectly. To convert 1kg of solid water at 0oC (273K) to liquid water at 0oC (273K) requires about 330,000J of energy. Note that the temperature of the liquid is the same as the solid�s, i.e. you added heat without changing the temperature, instead the phase changed. The heat added went into "breaking" bonds and increasing its potential energy, not into increasing the average translational KE of the molecules. If you go the other way, and convert 1kg of liquid water at 0oC (273K) to ice at 0oC (273K) releases 330,000J of heat. This heat comes from the energy given off when bonds form, i.e. it goes to a state of lower potential energy. The same type of thing occurs when a liquid changes to a gas. Then more bonds are broken as the molecules move apart, and it requires energy to break the bonds and move to a higher potential energy. To convert 1kg of liquid water at 100oC (373K) to 1kg of water vapor at 100oC (373K) requires 2,260,000J (almost 2.3 million Joules) of energy. That is, the water absorbs energy to change from a liquid to a gas.. If 1kg of water vapor condenses to form 1kg of liquid water, all at 100oC (373K), it releases 2,260,000J of heat. If you have a bowl of water standing in your house you may have noticed that gradually the water seems to disappear. What happens is that the liquid water is gradually turning into water vapor, without "boiling", the water temperature might be 25oC. The temperature is proportional to the AVERAGE translational kinetic energy. Not all molecules in the liquid have the same kinetic energy, and a few of the most energetic water molecules near the surface have enough energy to break their bonds and escape the liquid. These will leave the liquid. If water molecules from the air do not replace the ones that leave, the liquid will gradually disappear. This process is called evaporation. If the air is dry, not many water molecules are available in the air to replace the ones leaving the liquid, and the liquid disappears. If the air contains many water molecules, i.e. it has a high relative humidity, then many of the molecules that leave are replaced by molecules from the air and the liquid will not disappear so rapidly, i.e. some of the water molecules in the air condense into the liquid. When molecules or atoms of a liquid evaporate, the ones with the largest KE are the ones that leave. As they leave much of their KE is converted to PE as the bonds with other water molecules are broken. (The liquid state is at a lower PE than the gas state.) This reduces the average KE of the molecules left behind, and consequently their temperature is reduced.. We say that evaporation is a cooling process, because the liquid left behind is cooler than before. We depend on this process to keep us cool on a hot day. We sweat and are cooled as the sweat evaporates. Conversely, if a molecule of water vapor condenses on a drop of water, it goes down in potential energy and liberates kinetic energy which it transfers to the rest of the liquid molecules, increasing their average KE and therefore warming the liquid. . If the air is humid and many of the water molecules from the air are condensing as well, then the heat liberated by the condensation will counteract the cooling produced by the evaporation. In that case you may not cool very much, if at all. We use the process of evaporation to cool our homes. There are two different types. One just uses the evaporation of water to cool the air. These type of coolers are sometimes called swamp coolers. They work well if the humidity is low, but not so well in humid conditions. Therefore they will work well in the central valley but not so well in Mississippi. Even so, we don't use too many of them here. The second type is more common. It uses the evaporation of a material like Freon to produce the cooling and it operates in a closed cycle, not letting the Freon escape. This type of refrigeration unit has three parts, an evaporator, a condenser and a compressor. The Freon is initially a liquid under high pressure at the temperature of the outside. It moves through a tube to the evaporator where it goes through a constriction (small hole). The pressure on the evaporator side of this hole is much lower. At this low pressure and room temperature, the Freon will evaporate and become a gas. However, this drops the temperature drastically. At this point the tube containing the Freon moves through the region you want to cool, e.g. the refrigerator or blower of the air conditioner, absorbing heat from the warmer air around the tubes and cooling the air. The heat from the air warms the Freon and more evaporates continuing the cooling process until it all is transformed into gas. The tubing containing the Freon now leads outside of whatever you are cooling and it goes to the compressor. The compressor compresses the Freon gas greatly increasing the pressure on it and sends it to the condenser. At this point the Freon is hot because of the compression. 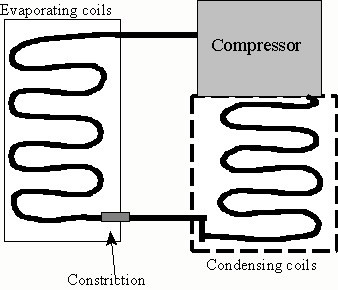 The work the compressor does to compress it is turned into thermal energy in the gas. (The compression stage is were we put in a lot of energy. We have to do a lot of work to compress the gas and this is what pushes up the electric bill.) The condenser tube containing the Freon is exposed to the outside air and it transfers heat from the Freon to the cooler outside air, which brings the Freon's temperature down and it condenses into a liquid again, which releases more heat that is transferred to the outside air. Now the Freon is a liquid under high pressure, and its temperature is about the same as the air outside. Now it is ready to go to the evaporator and start the cycle anew. These temperatures MUST be in Kelvin or absolute temperature. This assumes ideal behavior. If the two temperatures are close together, it does not require much work, but if they are far apart, it is harder to pump the heat Q outside, i.e. it takes more work. If Tc = 300K (or about 81oF) and the outside air is at Th = 310K (about 99oF), it takes at least 33J of work to pump 1000J of heat out of the house. That's not too bad. Real air conditioners would take a little more energy to do this since they are not ideal. The work you do also is converted to heat so the heat the house receives is 1000J + 73J = 1073J. It takes only 73J of Work to supply 1,073J of heat to your house. Although heat engines do not really come under phase changes, I will discuss them here. Many times we want to use the potential energy stored in chemical compounds, e.g. oil, to do work for us. One way to do this is a heat engine. We oxidize the compound (e.g. burn the oil) and use the heat to increase the temperature of something (usually a gas) which then expands. As it expands we use that expansion to do work on something (e.g. a piston in a car engine). In this expansion some of its thermal energy is converted into work and it cools. In this case we are using a flow of heat to do useful work for us. We use this type of conversion in gasoline engines and when we generate electricity from coal and natural gas. We generate electricity by burning coal to convert water into steam under high pressure. We then let this steam expand and turn a turbine (a fancy fan). 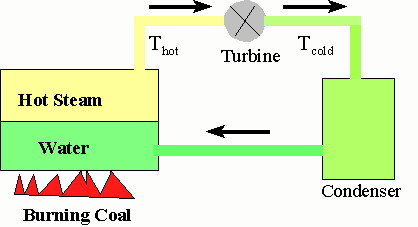 In this process some of the steams thermal energy is converted to work which causes the turbine to rotate. When the turbine rotates, it spins a magnet in a coil of wires and the kinetic energy of its rotation is converted into electrical energy. Meanwhile the steam has cooled somewhat as it did the work on the turbine. The steam could be vented to the outside, but it is usually the steam is cooled further to condense it back into liquid water and then pumped into the water reservoir to be converted into steam again. This is shown below. You must use the absolute temperature scale (Kelvin) in the above equation. This is the maximum efficiency you can have. If Thot = 800K and Tcold = 300K, then the maximum efficiency = 500/800 = 0.625 = 62.5%. In reality, you usually get somewhat less than this. A coal fired electrical power plant would have an efficiency of 30-40%. New designs that use higher steam temperatures and better turbine systems are the more efficient ones, while older ones only have efficiencies of about 33%..